"These findings are incredibly exciting," said Jessica Cait, the study's lead author and a graduate research student at the Biomedical Research Centre at UBC. "For the first time, we have been able to show that this protein is critical to the integrity of the blood-brain barrier." 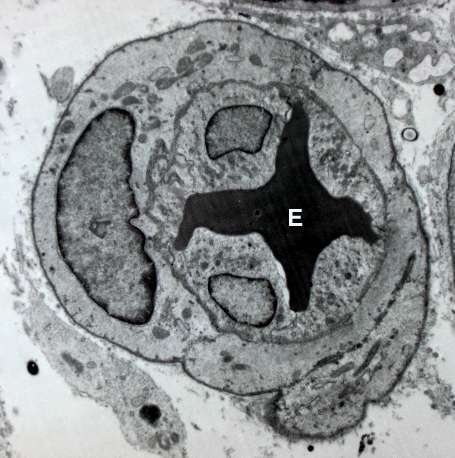 To conduct the study, the researchers performed an analysis of the effects of podocalyxin loss in human endothelial cells, as well as in mouse models of inflammation. They were able to show that endothelial cells, which provide the inner tubing of blood vessels, require podocalyxin to strengthen blood vessels. The protein helps generate tight contacts between the cells so that potentially harmful blood components or bacterial and viral toxins can't permeate brain tissue during times of inflammation. "Until now, the function of this protein was a mystery," said Dr. Michael Hughes, co-lead author and a research associate at the Biomedical Research Centre. "Nobody thought to look at this as something controlling the blood-brain barrier." "A significant hindrance to treating neurodegenerative diseases at the moment is that most drugs can't cross the blood-brain barrier," said Dr. Kelly McNagny, the study's senior author and a professor in UBC's department of medical genetics and the School of Biomedical Engineering. "But if we are able to induce transient opening of the blood-brain barrier, that could allow us to deliver treatment directly to brain tissue." What is the blood-brain barrier and how can we overcome it?